Did you hear the joke about the paperless office? Now that we've laid that myth to rest, scientist Paul Smith at Xerox Research Centre of Canada has made a real breakthrough with Erasable Paper. The paper is embedded with a material that changes color when exposed to light and is projected onto it by an inkless printer. 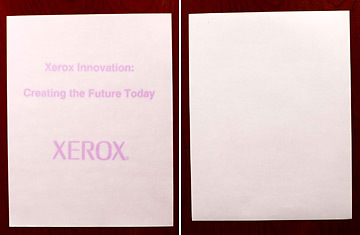 The text disappears in 24 hours, so you can reuse the sheet.